Since it was first launched, the Freak has become arguably Ulysse Nardin’s most distinctive model collection. This year, they have updated it not only with their first automatic version, but also using new technology first unveiled inside the Innovision 2 concept watch. At the heart of this new model is the Manufacture Calibre UN-250, beating at 21,600VPH and with fifty hours of power reserve. In the years since the Freak was first launched in 2001, there have been numerous changes and tweaks to its design and movement, which was notable for its pioneering use of silicon in its escapement, spearheaded by Dr Ludwig Oeshlin. Silicon meant that the dual escape wheels were lighter, more efficient, harder, more elastic, friction/ lubrication free, and thus more resistant to wear and tear. The silicon balance wheel has been further updated for the Freak Vision, and now has nickel elements to make the balance wheel lighter. Silicium micro-blades have also been added to increase accuracy and stabilise amplitudes. 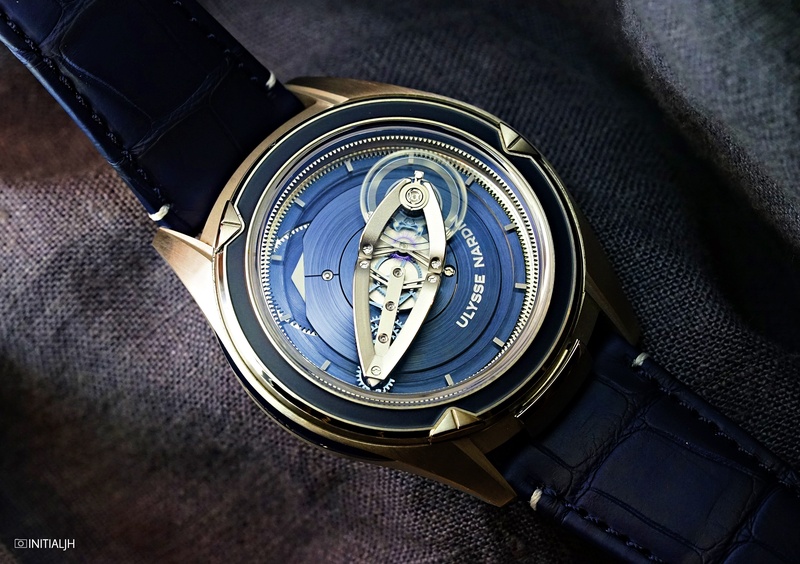 Other technical firsts include the Grinder Automatic Winding System which connects the oscillating rotor to a frame with four arms, providing twice the torque while a flexible guidance mechanism limits friction. However, it is not purely about technical changes in the Freak Vision. Time is still indicated in the still unconventional but nontheless now familiar “Freak” way, but there have also been design changes in the form of a new upper bridge that’s inspired by a boat’s hull, box-domed sapphire that means a thinner middle section and bezel, and a new case with horns, bezel, and rubber. It’s the Freak coolness, in a more sleek form. Water resistant to 30m / 100ft, the 45 mm case is platinum with lateral brancard side bars coated with blue rubber, and a titanium open case back with sapphire crystal. The Ulysse Nardin Freak Vision’s RRP is 95,000 CHF.